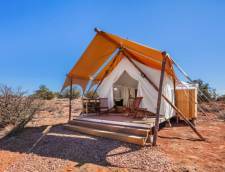 Grand Canyon Under Canvas offers luxury camping a short distance away from Grand Canyon National Park. 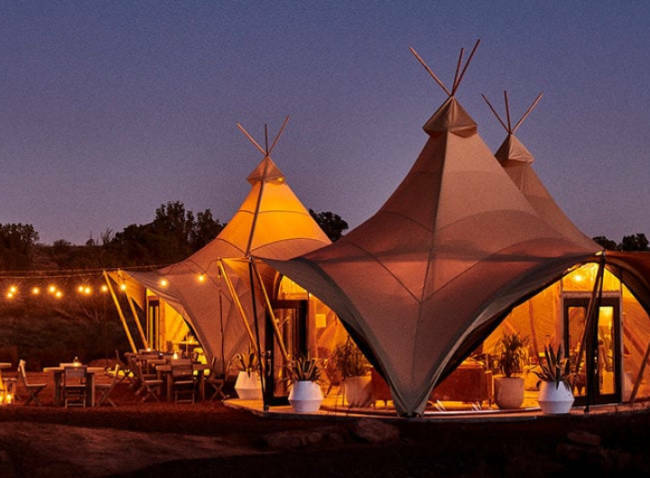 Under Canvas offers a variety of tents to choose from to suit your vacation needs. 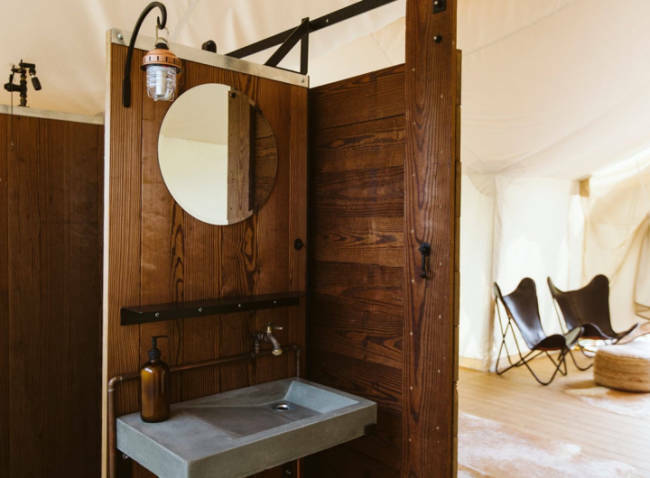 The Deluxe and Suite Tents offer private bathrooms, wood stoves, and a king size bed, the Safari Tents offers a king bed, wood stove and communal bathhouse a short walk from the tent. 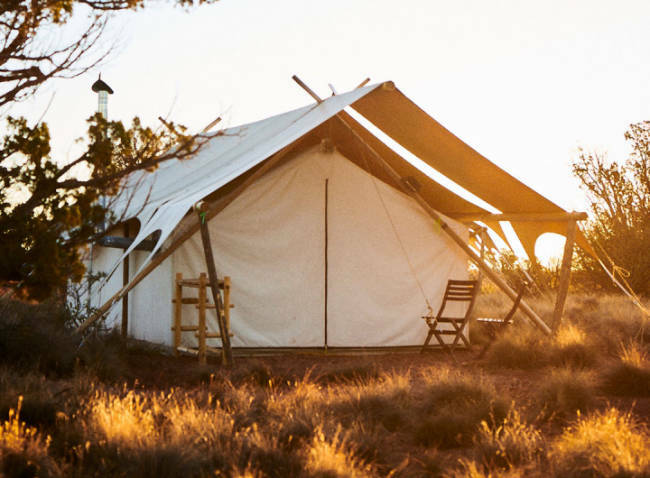 Grand Canyon Under Canvas also offers an extensive variety of activities in a short distance from the campsite, such as hiking, biking, and horseback riding. Dining is also available for your convenience at the camp. Breakfast, box lunches, and dinner are available daily. 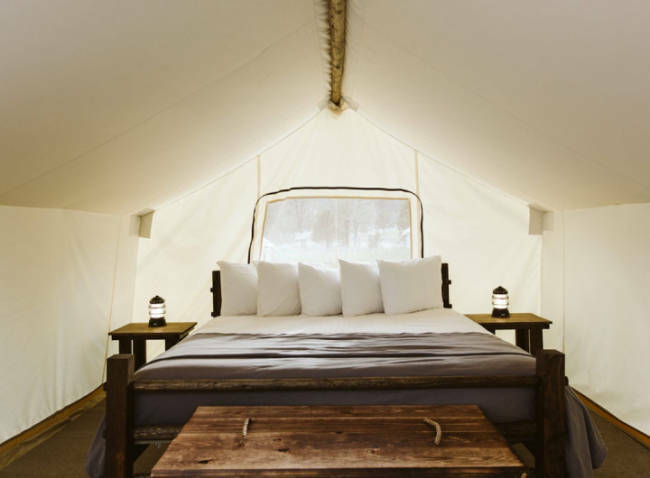 The Deluxe Tent features a king bed, linens, wood stove, wood flooring, private deck with chairs and a private bathroom with a shower, sink and flushing toilet. 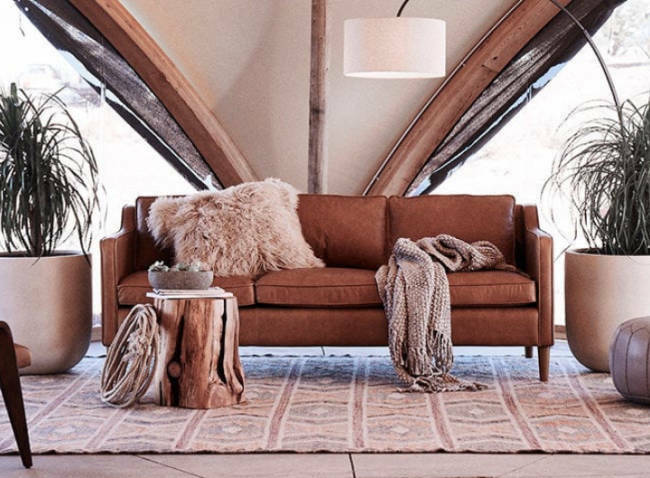 The Suites feature a little more room with a lounge area that offers a queen sized sofa sleeper, wood stove, a king bed with linens, private deck and a private ensuite bathroom featuring a shower, sink and flushing toilet. 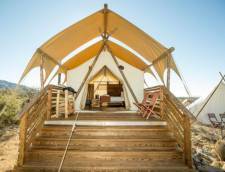 The Stargazer Tent is a one of a king tent available at Grand Canyon Under Canvas. It features a viewing window about the king bed to watch the stars at night. Great for the kids or a romantic night of star gazing after a long day of exploring the park. 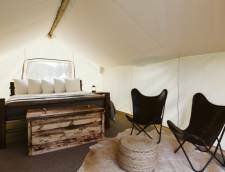 This tent also features a wood stove, private deck and ensuite bathroom with a shower, sink and flushing toilet. 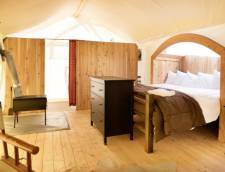 The Safari with 3 Twin Beds features a wood stove, linens, and outside chairs. A communal bathhouse is a short walk away from the tent. 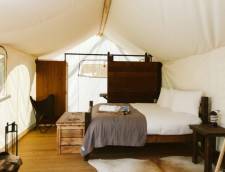 The Safari Tent offers a king bed with linens, a wood stove, chairs, trunk, and lamps. A communal bathhouse is just moments away from the tent. 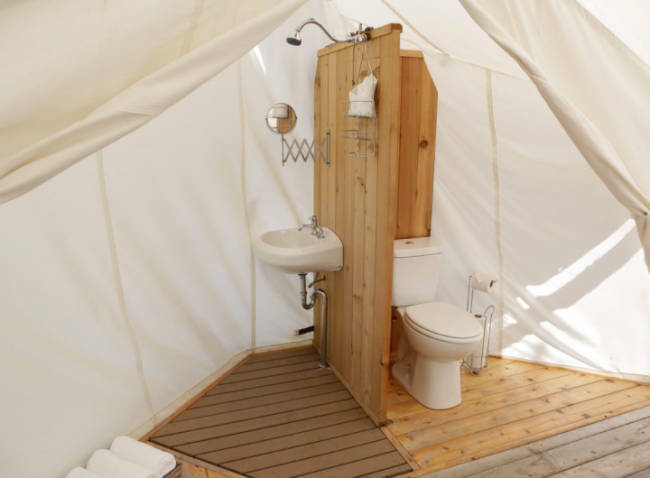 The Deluxe Tent offers a bathroom with a shower, sink and flushing toilet, a wood burning stove and a private porch with furniture. The adjacent hive features additional sleeping area for two guests. The Stargazer Tent with Adjacent Hive offers everything the Stargazer Tent does with the exception of the Hive giving you an additional two more sleeping spots. The Suite features a king bed, wood stove, leather queen sofa sleeper, a private deck with chairs, and an ensuite bathroom. The adjacent Hive offers guests two more additional sleeping spots. 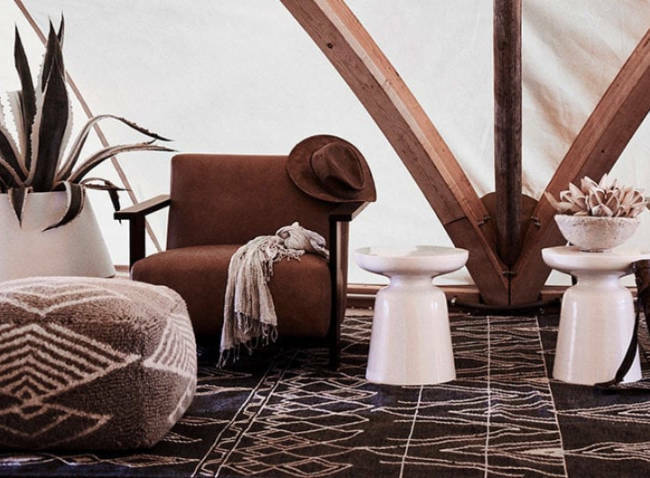 The Safari Tent offers a wood burning stove, a king bed and shared bathhouse moments from the tent. The Hive features two twin beds for additional guests. 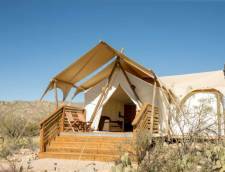 Grand Canyon Adventure Package is a three-day lodging and excursion package, that begins the moment you reach Grand Canyon Under Canvas. Each day is carefully planned out with adventure in mind. Start out with a guided hike at the Grand Canyon area, meals, and relaxation are all provided in this package. Included: 2 nights of lodging, 2 days of breakfast, lunch, and dinner as well as the activities listed in itinerary and park fees. Not included: airfare, airport transportation, and gratuities. All packages canceled outside of 60 days will receive a 95% refund. Cancellations inside 60 days of check-in date are 100% non-refundable. Travel insurance is encouraged. 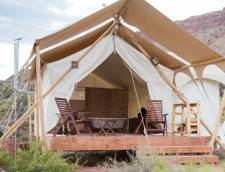 Grand Canyon Under Canvas can accommodate any dietary restrictions for all included meals. Menu choices will be coordinated directly by the concierge agent. 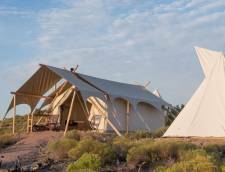 *Final package prices depend on tent type, tent availability and number of people. Grand Canyon Expedition Package is a four-day vacation package offering professional guide hiking and driving tour of Grand Canyon National Park, guided biking tour with a local expert, three-hour sunset Jeep Safari trip, relaxation time and meals are all included. Included: 3 nights of lodging, 3 days of breakfast, lunch, and dinner as well as the activities listed in itinerary and park fees. Not included: airfare, airport transportation, one dinner, and gratuities. A deposit equal to 100% of your total stay is required At the time of booking and will be charged to your Credit Card. A minimum of 14 days notices for cancellations or changes. Reservations canceled or changed more than 14 days prior to arrival will be refunded minus a 5% cancellation fee. Reservations canceled within 14 days of the scheduled arrival. Non-refundable pet fee of $25 per pet per stay. Pets can not be left unattended in the tent and must be on a leash at all times. 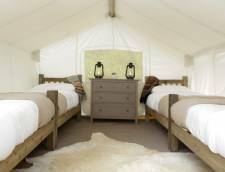 All tent rates include up to 4 guests. Additional guests can be added to certain tent options for $25 per person per night.